Hollywood has been swiftly outing its many predators over the last few months, with multiple men being forced to reckon with their sexual misconduct allegations. Along the way, that has meant a great deal of clumsy, self-serving apologies. Fortunately, musician and artist Lauren Maul is here to make sense of those sorry sorries with her forthcoming album Apologies from Men. She already cracked us up with an animated video of Louis C.K. 's apology, and now she's given Exclaim! 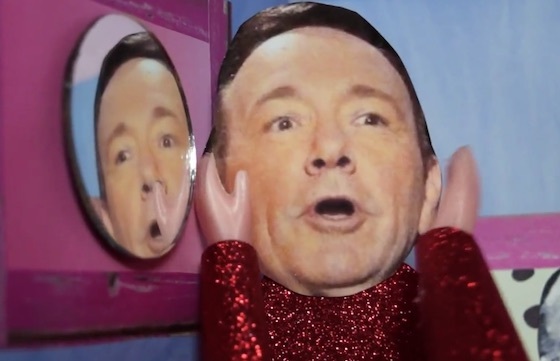 an exclusive premiere of her Kevin Spacey music video. Spacey offered his apology after actor Anthony Rapp accused him of making inappropriate sexual advances on him when he was just 14. Spacey famously used his apology to come out of the closet, a move that many felt was an attempt to distract from the gravity of the claims. Of course, since then, dozens more have come forward to accused Spacey of sexual assault and harassment, thus making his initial apology seem even more ridiculous. Maul attempts to make sense of the whole thing with a surprisingly catchy disco tune and accompanying music video. Check out the full thing below, and look for Apologies from Men to drop in 2018. Until then, visit the album's official website here.